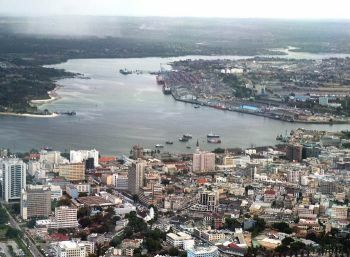 Dar es Salaam is the largest city in Tanzania. With its location on the Indian Ocean coast, separated from the island of Zanzibar by the Zanzibar Channel, it is also the manufacturing and commercial center of the nation. The city began as a fishing village in the mid-19th Century and gradually became an established port and trading center. The site of Dar es Salaam was originally a small village named Mzizima (Kiswahili for healthy town) dating back to 1857. Later, it became the site of plantations growing cassava, millet and maize. Dar es Salaam, an Arabic name meaning “haven of peace,” was formally founded by the Majid bin Sayyid (c. 1834-1870), the Sultan of Zanzibar, in 1866. The city fell into decline after the death of the Sultan in 1870 but its fortunes were revived when the German East Africa Company established a trading station there in 1887. As the German colonial presence in east Africa grew, Dar es Salaam became the administrative and commercial center of the colony. In 1900 it became the eastern terminus of the Central Railway Line that ran into the interior of German East Africa. British forces took control of Dar es Salaam and German East Africa during World War I. They renamed the colony Tanganyika but retained Dar es Salaam as the capital. The British also legalized the informal residential segregation of the city that began under the Germans. There was a European section (Oyster Bay) and two African sections (Kariakoo and Ilala). Eventually a fourth section was developed for Asians. Dar es Salaam grew rapidly after World War II and soon became the center of anti-colonial agitation led by the Tanganyika African National Union (TANU) founded in the city. When Tanganyika became independent in 1961, Dar es Salaam became its first capital, a position it continued to have when Tanganyika and Zanzibar merged in 1964 to become Tanzania. Although the interior city of Dodoma was announced as the new capital of Tanzania in 1973, Dar es Salaam continues to be the location of most government offices. Dar es Salaam is the home of a number of universities including Ardhi University and the University of Dar es Salaam. The population of the city in 2002 was 2.5 million, of which approximately 40% is Muslim and 30% is Christian. Willie F. Page, ed., Encyclopedia of African History and Culture, Volume 1, Ancient Africa (New York: Facts on File, Inc., 2001); http://www.utalii.com/Dar-es-salaam/Dar-es-Salaam_the_city.htm; http://www.tanserve.co.tz/towns/index_files/Dar.htm; James Brennan, Andrew Burton, and Yusuf Lasi, Dar es Salaam, Histories from an Emerging African Metropolis (Dar es Salaam: Mkuki na Nyota Publishers, 2007).